Before Beyonce, there was Michael Jackson. The original King of Pop, who invented what it meant to be a POP STAR, he even invented the music video! What a G! Or Maybe an M-J! I mean… the man earned 13 Grammys, 26 American Music Awards and sold an estimated 400 million records worldwide. And that was ALL before the help of the world wide web, when the music spoke louder than the followers. The King of Pop served a long and spectacular reign in the music industry from his professional debut aged 6 in 1964, to his unfortunate and tragic death in 2009. But whilst the King of Pop may have returned to music heaven and cemented himself in the Hard Rock Hall of Fame… his legendary music lives on… and boy do we love dancing to it, and so do you guys… he’s one of our Top Trending Dance Parties. Quite remarkably, yet understandably… he’s one of our Top Trending KIDS Dance Parties too! Those little’ens can’t get enough of the that MJ flavour. And our Dance Party Teachers sure know what they’re talking about when they’re teaching the Michael Jackson Dance Party! We don’t mean to brag, but our Dance Party teachers have appeared in West-End and World Tour productions of Thriller Live! 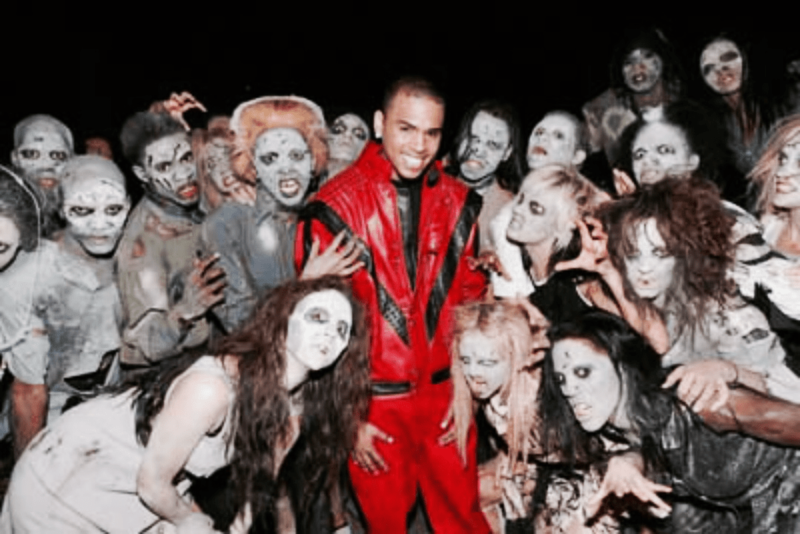 One of our teachers even danced in Chris Brown’s Thriller tribute at the World music awards! So who better to teach your Michael Jackson dance class? Now that is Thriller! Thanks to the internet, Michael’s legendary spectacular stage shows can be seen by audiences both old and new, and over and over again! But what was it that made us all so captivated and entranced by MJ’s performances? COSTUMES – Michael Jackson wore some of the most iconic stage costumes of all time! He turned classic military jackets into a Pop Star’s must-have costume piece. And he loved a signature fashion accessory too! A featured white sock and cropped trouser, a statement white glove, or his Rockstar red-leathers! He knew how to turn looks! And ​included in your MJ Dance Experience package ​we have those Michael Jackson accessories for you to borrow… ​FREE MJ white glove, red & black jacket and tight-curl black wig so the King of your party can manifest that MJ magic. But don’t forget, Michael Jackson loved a costume change! So why not bring your own sack of MJ inspired looks so your main event can keep turning looks like the THRILLER star they are! DANCE CHOREOGRAPHY – Michael Jackson practically invented “the dance-break” (when the lyrics stop, the music keeps booming and the Pop Star cuts loose and throws the sickest dance shapes with their army of dancers!) And MJ danced some of the most iconic dance-break-choreography in stage history! Our Michael Jackson Dance Parties are inspired by these very routines. 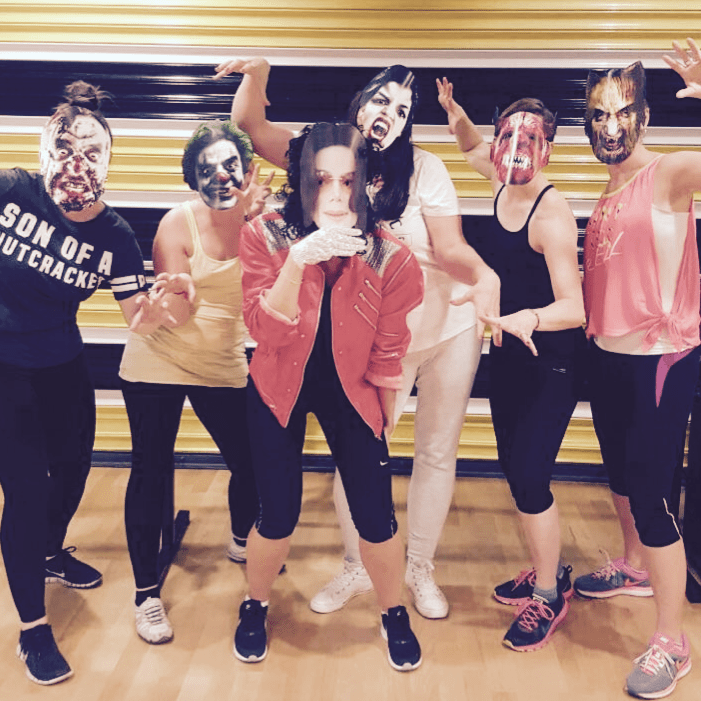 So when you book your Michael Jackson Hen or Stag Dance Party, you’ll be learning dance history – which looks BAD on the dance floor ;-) You can book either our THRILLER DANCE PARTY – inspired by the most influential pop music video​ of all time​, choreographed by Michael Peters and Jackson himself. Or if you want to sample a taste of several MJ flavours; in our Michael Jackson Mash Up Dance Party you’ll learn some seriously slick moves to a medley of Beat It, Thriller and Bad! It was at the Motown 25thAnniversary Special, MJ was Billie Jeaning and towards the end of his mesmerising performance, he backward-toe-heeled-toe-heeled-toe-heeled – It only lasted 2 seconds… but that was enough to make pop history and take Michael Jackson to peak fame – shamone! 2. When he said a WHOLE lot by just doing nothing! Twas the 1993 Superbowl Half Time Show – (you know… the one where only the BIGGEST of stars headline). Considering the King revolutionised dance… he began by just standing still… and the crowds LOVED IT! He even squeezed in a costume change… inventing what most Queens know call, “a reveal”. We’re not gonna lie… there’s not much standing still in your Dance Party teehee. 3.When he defied the laws of physics – gravity? Whats that? The King was stunning the World on his ‘History World Tour’ – when during Smooth Criminal, he premiered the infamous Michael Jackson lean-forward… and he leaned some more… and more… he was practically horizontal! Oh MJ you are magic! MJ invented the​ dance​ music video… and now here he is performing at the 1995 Music Television; Video Music Awards. But despite changing how we see music on screen, he still proves he can bring it to the stage just as hard in this awesome mega mix of all things MJ! How many iconic MJ moments can you spot? 5. Not the stage… but the world’s first music video! Thriller was Music Television’s World Premier music video and changed the Music Video genre forever. 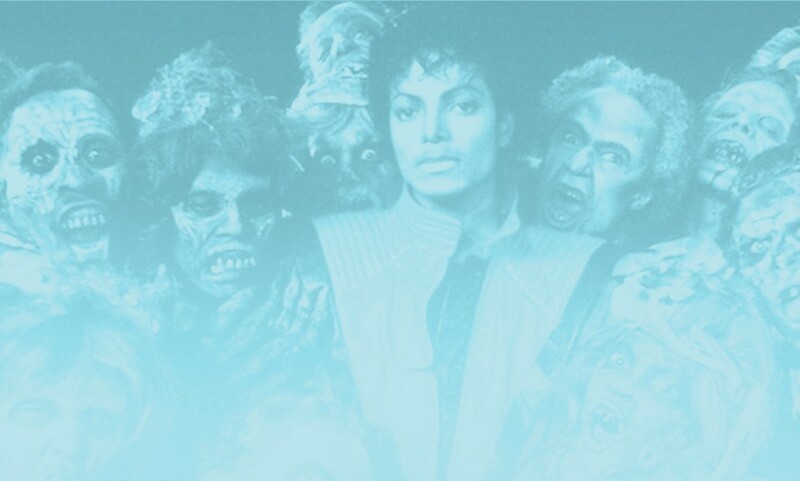 The 14 minute mini-horror movie accompanied the legendary Thriller track that has been voted the most influential pop video of all time; for creating the concept of merging filmmaking with pop music. Michael Jackson and choreographer Michael Peters would come to rehearsals dressed as zombies and worked solidly trying to discover a way of dancing like Zombies without it looking comical. And boy, did they create some sick dance moves! Dance moves that just like Zombies, are immortal! But our MJ Dance Parties are legendary! Loved by Hens, Stags, Kids Birthday and even office days out! So don’t miss out on the BADDEST dance class in your town! Now M​oonwalk your way to ​our MJ​ Dance class, they sell out fast, so “shamone!” BOOK NOW!